This series has been my guilty pleasure for so long. I eagerly await each installment even though the last two books haven't progressed the plot at all. I really don't have a reason for loving it...it's not good. I like it though and I'm going to be reading this series until the bitter end (which is hopefully next book). The majority of this book revolved around the love triangle between Jack- Evie-Death. After the Emperor attacked at the end of last novel Evie believed Jack was dead. She tries to find a way to bring him back but when that fails she returns to Death's door. I'll allay your fears right now with a spoiler that will come as no surprise, Jack isn't dead. Chapters in Arcana Rising alternate between Jack and Evies perspective. You know what bothers me the most about this love triangle? Evie can't just pick. There is so much inner monologue that I felt like I was drowning in her thoughts. I am solidly team Death. He's the better choice. So much better. But after listening to Evie I'm starting to feel like Death can do better. Evie has become a more well rounded character since the first novel but she still acts like a flippant teen when it comes to her personal relationships. I'd like to see her grow up in this respect next novel. The premise of this story is still really interesting to me. I love the idea of a big battle played out over time with real people representing the Arcana. I wish there had been more of that in this novel. Arcana Rising was a fairly short novel and in that time we barely got any fighting. It was all love triangle, no action. 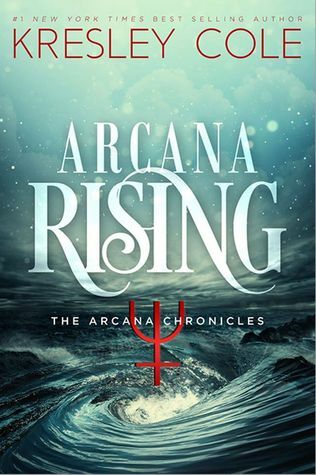 Overall, Arcana Rising wasn't my favorite installment in this series. It didn't have nearly enough action and Evie's inner thoughts were suffocating but I'm somehow still looking forward to the next book? Call me a sucker but this is still my guilty pleasure and I will definitely be reading the finale. Even if I'm afraid this series is taking a turn for Twilight #4: Breaking Dawn.